This article first appeared in Personal Wealth, The Edge Malaysia Weekly, on September 25, 2017 - October 01, 2017. 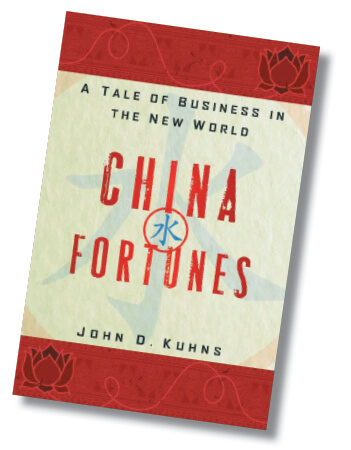 China Fortunes: A Tale of Business in the New World was written based on Kuhns’ personal experience. Most of the companies, people and incidents mentioned in the book are based on real-life examples. John D Kuhns’ experience in China in the 1980s could serve as an important guide for those looking to invest in frontier markets. Prospective investors would benefit from his valuable insights gleaned from his investments in Chinese private companies and gold mining ventures in Papua New Guinea. John D Kuhns, the author of China Fortunes: A Tale of Business in the New World, has learnt many important lessons and faced numerous challenges in his 30-year career as an investment banker, venture capitalist and owner of a US-listed company. In 1984, Kuhns was the first American to import commercial hydroelectric power-generating equipment from China. By purchasing the equipment at extremely low prices, he was able to quickly grow his renewable energy company, Catalyst Energy, and eventually list it on the New York Stock Exchange. From 1982 to 1987, Catalyst Energy was one of the fastest-growing companies in the US. Its share price soared from US$3 apiece to a peak of US$29 and the company eventually became a US$1 billion concern. Kuhns recalls that China, under the leadership of Deng Xiaoping, was just beginning to open its markets to the world in the 1980s. “Like North Korea today, China was a secluded nation and foreigners had limited access to it. You had to hire a Chinese agent to hook you up with local officials and business people there and help you with the translation. It was a mysterious country and very few people travelled there or did business with the Chinese,” he tells Personal Wealth. Despite Kuhns’ initial success with the imported equipment from China, he had to sell his company in 1988 due to financial difficulties. It was a year after the infamous Black Monday, when the Dow Jones Industrial Average plunged 22.61% and sent global markets into turmoil. By 1992, Kuhns was back in the renewable energy business. This time, he had used his own savings for his China venture. He also raised funds from Wall Street investors and set up New World Power Corp in the US to develop and finance renewable energy, mainly hydroelectric, projects in China and the Philippines. The company also invested in solar energy in Latin American countries and wind energy in Ireland and the UK. In China, Kuhns formed a joint venture with Wu Han Steam Turbine (owned by the city of Wuhan) to build a hydroelectric plant on the Min River in Fujian province. This venture was successful as well. With his extensive experience in the finance industry and vast connections with investors on Wall Street, Kuhns started an investment firm in the early 2000s. US-based Kuhns Brothers would buy private companies in China with the aim of listing them on global stock exchanges when the time was ripe. The firm would earn a profit from the listing process. “We invested in private Chinese companies and re-registered them as wholly foreign-owned enterprises (WFOE), as a result of our controlling stake in the companies. The plan was to list them on international stock exchanges when the time was right,” says Kuhns. The WFOE is an investment vehicle that allows foreign investors in China to fully own a limited liability company without the involvement of mainland Chinese investors or companies. However, it does not mean that the Chinese could not be shareholders of a WFOE. “They could still be shareholders. But in agreeing to be shareholders of a WFOE, they were agreeing to be bound by the same accounting, financial and legal rules that foreign shareholders demand … WFOEs are not eligible to be listed on the Shanghai Stock Exchange, but we were happy to list them on other bourses such as the Nasdaq as well as the New York, Hong Kong and Singapore stock exchanges,” says Kuhns. In 2006, he decided to set up a private equity fund called the China Hand Fund to invest in China-based companies. “The fund was started because a lot of my investors who were previously involved in IPO deals said to me: ‘Hey, John, why don’t we give you some money and you can find some investments on the ground in China? Investing in companies at the pre-IPO stage could earn us bigger profits than investing in IPOs,’” he says. So, Kuhns started actively looking for private Chinese companies to invest in. Some of them were involved in the hydroelectric business, which Kuhns was very familiar with. But there were also companies involved in silicon smelting, carbon product manufacturing, particle board manufacturing, ethanol production and natural gas distribution. While Kuhns does not reveal the actual returns of the fund, he says it was one of the few private equity funds in China to make positive returns between 2007 and 2014. “Unfortunately, I am not allowed to disclose the figures. But we did make money,” he says. Kuhns ventured into China because the US renewable energy market had become highly competitive in the late 1980s. It was turning into a red ocean as investors and corporates were throwing “dumb money” into a relatively new industry to carve out market share. Meanwhile, China was a blue ocean with huge business and investment opportunities. The developing nation was in urgent need of energy to power its economy. The cheaper the cost to produce energy, the more it was welcomed by the Chinese government. Hydroelectric power was a very strategic source of energy back then. That is because China had insufficient reserves of fossil fuels such as coal and natural gas to drive its economic activities, says Kuhns. On the other hand, China had potentially the largest hydroelectric resources in the world. With its steep rivers, narrow gorges and heavy runoff, the country was able to generate cheap electricity easily. “China welcomed foreigners who wanted invest in its hydroelectric plants. It was desperate for energy,” says Kuhns. The Chinese government was not the only one in need of investments. Private companies were also eager for equity financing to fund and expand their businesses. “China developed rapidly after 2000 and things were going well. Yes, Chinese companies could get loans from the big banks, but there were very few opportunities for equity [financing] in the country. There were no local private equity firms at the time to provide these companies with equity financing. They were very desperate for it,” says Kuhns. Because of this, he was able to buy equity in some of the Chinese companies at a low price. “We were able to buy into some of them at two to four times their cash flow. Ten years later, these companies in general were priced at 16 times earnings,” says Kuhns. These factors, coupled with his extensive knowledge and experience in the renewable energy sector, made it a natural choice for him to venture into China’s private equity space. “I often enter a country by investing in hydro projects. It is like second nature to me as I have done this throughout my career,” says Kuhns. After setting up the China Hand Fund, Kuhns identified hydroelectric companies in several provinces and began negotiating with the business owners. It was not an easy process. Kuhns knew the importance of having a controlling stake in these private companies, but many of the business owners were not willing to give up control. “We needed control as we were investing five to seven years down the road. When you invest in private equity in the US, it is a given and business owners know no PE investor can take a minority stake,” he says. “In China, this does not work with many businesses as the owners tend to use their companies’ cash flow as their own cheque book. They are going to do whatever they like. However, Kuhns was able to strike deals with some of the local businesses as he was a foreigner, which meant he was an “investor with big bucks” in the eyes of the Chinese. Also, he had established a reputation in the country as he had been trading and investing there for many years. Money and reputation alone do not make a successful private equity investor in China. Relationships are also key to success, says Kuhns. One of the China Hand Fund’s successful investments was in a silicon smelting company. The fund bought into the company at three times its cash flow in 2007. Two years later, the company was sold to Spain-based FerroAtlantica, one of the largest silicon smelting companies in the world, at nine times its cash flow, giving the fund a 300% return. “Our initial plan was to prepare an IPO for the company and list it on the Hong Kong Stock Exchange. We could have probably sold it for 12 times its earnings [instead of cash flow] if we had been able to do that. But the global financial crisis hit in 2008 and there was a big recession the following year. We had to sell the company. We still made a profit, but we left some money on the table,” says Kuhns. How did he come across this deal? He says the China Hand Fund owned a hydroelectric plant in the southwest area of Yunnan province and it was the largest power supplier to the electrical grid in that area. One day, the mayor of one of the counties approached him and introduced him to Yao, the owner of the silicon smelting business. “He said, ‘Hey, you are the largest supplier of power to the county. Would you like to meet the largest consumer of electricity in the country? Perhaps you can work out a deal with him because he needs money.’ It turned out that Yao was a nice person and we invested enough in his company to have control. That was a very good deal and he was a good manager,” says Kuhns. This was just one example of how relationships play an important role in China’s investment world. Another example is how Kuhns got to know Dr Lin, the grandson of Lin Bo Qu, one of the key leaders of the Communist Party of China. “When you look at the photo of Mao Zedong on stage in Tiananmen Square declaring to the world the setup of the Central People’s Government, one of the people standing beside him is Lin’s grandfather. Without Lin, we wouldn’t have been in the hydro business,” says Kuhns. After all, money, reputation and relationships help enhance each other. “I bought equipment from China in the 1980s and did joint ventures and IPOs there in the 1990s. I did not go looking for him; he found me and invited me to go to China one day. We ended up doing deals together and were comfortable working with each other,” says Kuhns. That was how he discovered that the best way for foreign investors to enter China was to find one of the country’s “princelings” before making any investments. The princelings, also known as the Communist Party’s crown princes, refer to the descendants of prominent and influential senior communist officials in China. Lin is one of them. “Before you make any investments, you have to find a princeling and make friends with him because if you are not connected to the top of the heap in China, you are wasting your time. You will always lose out to someone who is better connected. You are not going to get opportunities. The key is to really find a princeling, someone related to a big family in China,” says Kuhns. However, being associated with the crème de la crème in China does not guarantee the success of any investment. Before kicking off the China Hand Fund, Kuhns had formed China Hydroelectric Corp in 2006. It was once the largest foreign-owned power company in the country with 26 hydroelectric projects under its belt that could generate 563mw of electricity. The company was listed on the New York Stock Exchange in 2010. “We needed to have a success story before we could kick off the China Hand Fund. That was why we formed China Hydroelectric Corp,” says Kuhns. Lin was the key to the company’s success. He had wide connections and relationships with government officials and business people in the country. Meanwhile, Kuhns had many connections on Wall Street. “Lin was very familiar with China’s hydro industry. I was familiar too. He had relationships in China and I had relationships overseas. I could bring money in and we could find the sites we wanted. It was the perfect marriage,” says Kuhns. The China Hand Fund reached its “prime” in 2012, six years after it started investing in the country, he says. Businesses that the fund invested in had produced good results and he was prepared to exit those deals and reap returns when the time was ripe. However, Kuhns, who was chairman and CEO of China Hydroelectric Corp, was suddenly kicked out by Lin and the other shareholders. The reason they gave was that the company had incurred too many expenses at its New York office, which was in charge of all the filings with the New York Stock Exchange (NYSE) and regulators such as the Securities and Exchange Commission. “I will tell you why. That was because we were listed on the NYSE and had a regulator to report to,” says Kuhns. While Kuhns was in New York, he received a letter informing him that Lin was going to be the new chairman based on the reasons given above. Kuhns called as soon as he found out to tell him that they were partners and all of the excuses were complete lies. But Lin did not accept his argument. In the end, Kuhns sold his shares in China Hydroelectric Corp. The company’s stock price plunged when news got out about the matter. However, he still made a big profit as he was the company’s initial investor. The issue was not about money, says Kuhns. It was the relationship that mattered. “I thought Lin was one of my best friends. I visited his family in Australia. I even took my family there for a visit. But when the event happened, he was very comfortable doing that. It was like somebody kicking you in the stomach. At the end of the day, even with the right recipe to invest in China, it is extremely hard for foreign investors to find people they can trust and avoid being taken advantage of, says Kuhns. This, he adds, is one of the key challenges foreign investors face when doing business in the world’s second largest economy. After the China Hand Fund was wound up, the returns were distributed among its investors. There was some thought given to setting up another fund, but Kuhns found it to be unfeasible as the landscape was no longer as attractive as it once was. That was because by 2012, China’s private equity industry was thriving and many wealthy Chinese families and businessmen were pumping money into private businesses. This drove the valuations of private companies much higher than before. “The Chinese could afford it because they could list the companies on the local stock exchanges, such as the Shanghai Stock Exchange, and sell shares at 40 times their earnings. Foreigners like us could only list companies on foreign exchanges such as the Hong Kong Stock Exchange. And we knew that if we could list an IPO on a foreign exchange at 40 times earnings, we were probably kidding ourselves,” says Kuhns. He began looking for other investment opportunities, particularly hydroelectric projects in Southeast Asia. However, it was a gold mine on Bougainville Island that caught his attention. Previously known as the North Solomon Province, Bougainville is the autonomous region of Papua New Guinea and had a population of 249,358 in 2011, according to online sources. In the 1970s, the gold mine was operated by Bougainville Copper Ltd (BCL), a subsidiary of Rio Tinto, one of the world’s largest metals and mining corporations. BCL estimated that the value of the gold in the mine was US$150 billion, says Kuhns. However, BCL had to pull its mining operation out of Bougainville Island in the late 1980s due to a civil war that caused between 15,000 and 20,000 deaths, mainly due to the uneven distribution of wealth among the people. “At one point, gold mining in Bougainville contributed to about 45% of Papua New Guinea’s gross domestic product. At the end of the day, the people who lived in Papua New Guinea benefited from the gold, but not the people of Bougainville. The civil war started and the mines were shut down, so BCL left the island,” says Kuhns. Today, he and his fellow investors in the Bougainville Investment Fund operate several businesses on Bougainville Island, including a gold exchange company and a gold mining company. “We own a gold exchange company on the island, which is registered as the Bougainville Gold Exchange Ltd. It is currently the largest gold buyer, dealer and exporter on the island. We also obtained a gold mining licence from the Bougainville government and received the consent of the landowners to start mining gold there,” says Kuhns, adding that the landowners are representatives of the clans or tribes on the island. While Kuhns is unable to disclose how much money is invested in Bougainville Island, he does reveal his reasons for investing there. The first is that the people there were in urgent need of investments and expertise to turn the natural resources on the island into cash to prepare them for independence. “After the civil war ended in 1999, the government of Papua New Guinea granted the people of Bougainville Island the opportunity to secede from the country to become an independent nation. They will hold a referendum on June 15, 2019, to let the islanders cast their votes. I can tell you, there is no way the island will remain a part of Papua New Guinea after that,” says Kuhns. The second reason is his reputation on Wall Street and in emerging markets as an investor and financier willing to venture into “crazy and wild” places. “The people of Papua New Guinea are looking for foreigners with capital and who wouldn’t mind going to crazy places like early China and Bougainville Island. I have demonstrated the ability to do this,” says Kuhns. So far, he is pretty confident that his investments will be successful. One of the reasons for that is the Bougainville gold market is a virgin one without competitors. But he is not worried if other competitors start to enter the market. “If somebody wants to fly over here, good luck. Basically, the chief will tell him to leave. Previously, there were a lot of foreigners who came over trying to take advantage of them. That has made the islanders highly suspicious of foreigners. I am an exception in this case. That is why it is a pretty good opportunity for us,” says Kuhns. While there are political risks, he believes things will work out well. “You don’t go on the defensive all the time, but on the offensive. These people are sitting on gold, yes, but they have no electricity and are in need of food and running water. They are desperate for these things. So, what I told them is, ‘I am not just here for your gold. I am here to invest in other things, including renewable energy, and help you develop as a nation,’” he says. The Bougainville Investment Fund is expected to be open for investments in 2018 or 2019. “Managing a private equity fund from inception to winding up typically needs 8 to 10 years. 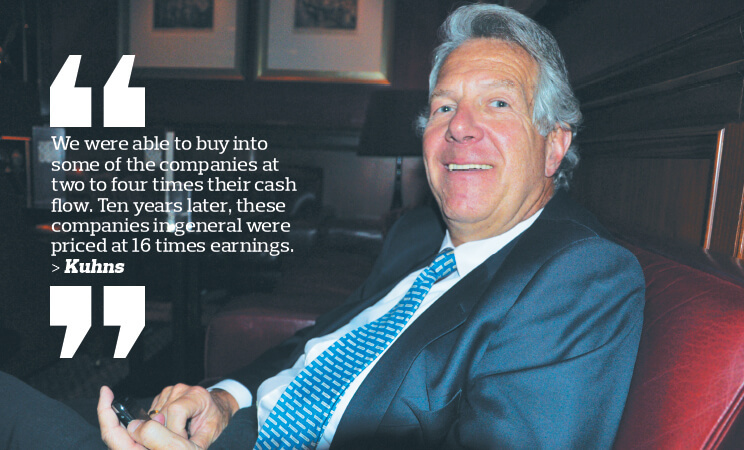 I believe this is the last fund I will manage,” says Kuhns, who is 67.